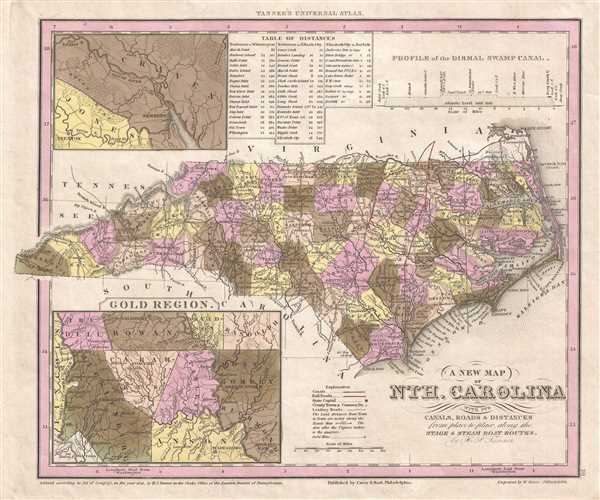 Includes an inset map of the Carolina Gold Region - the first Gold Rush in the United States. This is an 1845 Henry Schenck Tanner map North Carolina published by Edward L. Carey and Abraham Hart. The map depicts the region from Tennessee, North Carolina, and South Carolina to Cape Hatteras and from Virginia to South Carolina. Featuring an inset map of the Carolina Gold Region in the lower left corner, this map propagates the longstanding American desire to strike it rich. The first 'find' of the Carolina Gold Rush was made in 1799, by a 12-year-old boy name Conrad Reed. He found a 17-pound gold nugget while playing in Meadow Creek on his family's farm in Cabarrus County (depicted at the center of the inset map). As his father, John Reed, was unfamiliar with his son's find and what it was worth, the nugget spent the next several years as the family's door stop. In 1802, when Reed showed the rock to the local jeweler, the jeweler, who instantly recognized it as gold, offered Reed $3.50 for it. Still unaware of the rock's value, Reed agreed to the jeweler's offer. Eventually Reed learned of the value of the resource on his land and set up a partnership with several other men. As news of the discovery spread locally through newspapers, local landowners began searching for gold on their own land, since most of the land in the area was owned privately, establishing shallow surface mines on their property. By the 1830s, most of these surface deposits had been depleted, thus mining operations had been replaced by much more technical lode mining. With this development came a wave of immigrants from the Cornwall region of England. The people of Cornwall had been miners for decades, but the copper and tin deposits of the region had become exhausted. When word of the bonanza going on in North Carolina reached Cornwall, many miners immigrated to the region and brought their expertise with them. They built mines and taught the local Carolina miners their trade, which, in turn, helped drive the success of the much larger gold rush in California in 1849. A highly detailed map, counties are labeled throughout the state and shaded different colors to allow for easy differentiation. Myriad towns and cities are labeled, including Raleigh, Chapel Hill, New Bern (Newbern), Charlotte, Wilmington, and Asheville. A detailed depiction of the road network is illustrated as well, with the distances between cities and towns noted. Pamlico Sound and Albemarle Sound are both labeled, along with Roanoke Island and several locations in the Outer Banks. An inset map of the region around New Bern (Newbern), North Carolina is situated in the upper-left corner and labels the Neuse River, the Trent River, the town of Trenton, and Fort Barnwell. At the time, New Bern was the largest city in North Carolina and played a critical role in the Triangle Trade in sugar, slaves, and desired goods. A table of distances between New Bern and Wilmington, Elizabeth City, and Norfolk, Virginia is located next to the inset map. A profile view of the Dismal Swamp Canal is situated in the upper right corner. The Dismal Swamp Canal was the longest continuously operating manmade canal in the United States, opening in 1805 and, after repairs due to storm damage in 2016, reopened in November 2017, only to be closed again.